Geometry is essentially the study of the space we live in. Geometry also helps us learn more about other areas of mathematics such as number, algebra and measurement. Connections to science and art are easily made as students develop spatial sense by building shapes and designs. In Designing a Shape Gallery: Geometry with the Meerkats students explore 2- and 3-dimensional shapes and the relationships among them. The reasoning and spatial sense skills that they use will help them develop an understanding of the properties of shapes and relationships among shapes as they advance in their geometric thinking. Chapter 1 focuses on 2-dimensional shapes and the tiling of shapes using transformations to create tessellations. Chapter 2 explores the relationship between 3- and 3-dimensional shapes using 3-dimensional tangram blocks and bubbles. Chapter 3 investigates composing and decomposing 2- and 3-dimensional shapes. Throughout the unit students will be involved in creating a Shape Gallery for the Sensational Math Institute for Learning and Exploration (SMILE), the Meerkats’ children’s museum. 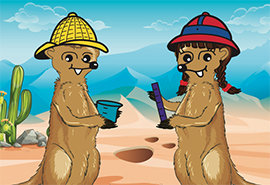 Students will also be developing their mathematical communication skills by communicating with the Meerkats, Dru and Teller. Measurement is a process that students use in their lives every day as they explore the world around them at home, at school, and in their community. They wonder how long the earthworm is, how tall they are compared to their best friend, how much older they are than their baby sister, how big the soccer field is, and how many cups of juice their new thermos holds. And this is just for starters! In Measuring with the Meerkats students will explore the measurement concepts of length, area, and capacity. Chapter 1 focuses on the attribute of length. Student will come to understand the need for equal-length units and learn about and use iteration through conducting safety crash tests. Chapter 2 involves measuring area. Students learn the difference between area and length and learn to measure area using non-overlapping equal-sized units to cover a 2-dimensional space, such as the meerkats’ dens. Chapter 3 introduces capacity as the amount of material a container is able to hold when full. Students will collect and analyze data while conducting an experiment related to the measurement of capacity. 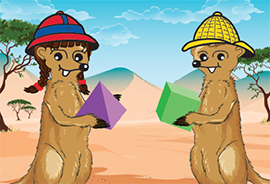 Throughout the units students will also develop mathematical communication skills by taking on roles as speakers, listeners, and writers in a math learning environment by communicating with two meerkats, Dru and Teller, who are interested in measurement. When they first encounter algebra in middle or high school, many students find it more like a foreign language. They do not see the connection between the math they have learned in elementary school and algebra. Nothing could be further from the truth! The fundamental properties that students use to carry out arithmetic operations actually provide the basis for most of the symbolic manipulations in algebra. Research has shown (Carpenter, Franke, & Levi, 2003) that primary students are capable of learning important overarching ideas of mathematics that are foundational to both algebra and arithmetic. In this unit, students explore these foundational concepts and properties and come to recognize the connections between number and algebra. 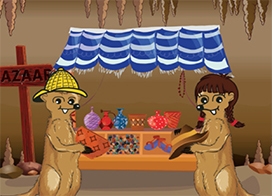 In Shopping at the Bazaar: Connecting Number and Algebra with the Meerkats, students investigate the meaning of equality and the equal sign; solve equations in a variety of ways, including using relational thinking; and strengthen their number concepts and operations by solving interesting problems. Chapter 1 focuses on the meaning of equality. Students are introduced to the equal sign (=), the not equal sign (≠), learn about expressions, and write equations. They also begin to learn about what is means to think and act like practicing mathematicians and are introduced to the speaker, listener, and writer roles. Chapter 2 introduces students to relational thinking. Relational thinking is used when students reflect on relationships between mathematical expressions and determine what is needed to make the two expressions equal. This type of thinking is critical in algebra and it can enrich the learning of mathematics. By thinking about relationships among numbers and using what they understand about equal relations, students begin to generalize arithmetic, an important part of algebraic thinking. Chapter 3 begins with students using bar models and then equations with variables to represent a variety of situations. Students solve one-, two-, and multistep addition and subtraction problems of all types in the context of shopping at the bazaar. They must help Dru and Teller solve riddles presented to them by shopkeepers to determine the cost of products and pay for them in mula (meerkat money). The students are then encouraged to write their own riddles (multistep problems),which can be showcased in a Family Math Event. Throughout the unit, students are helping Dru and Teller as they head to the Botswana Bazaar to sell their agates and shop at various booths to purchase goods. Along with learning advanced math concepts, students develop their mathematical reasoning ability and learn to communicate effectively both orally and in writing.